It also looks as though you can have more than 61 items in a single conversation thread. Nice. IMO, the most interesting change is the "tabs" one. 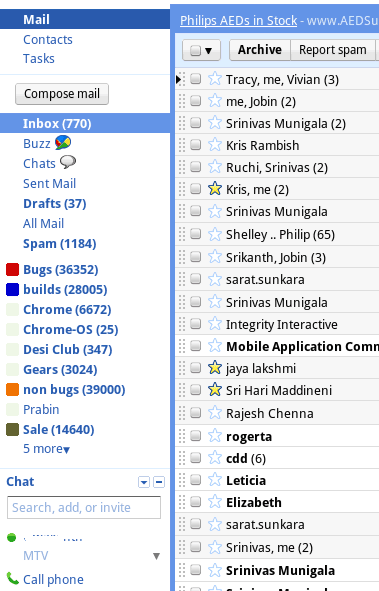 Mail, Contacts and Tasks now seem to be different apps inside Gmail. I guess the Tasks feature will open the full canvas view (see https://mail.google.com/tasks/canvas). some design tweaks as well ... chat is not in a modular box with rounded edges as it is now. in this screenshot it's only separated by a line separator. when is this hitting the street? What's the deal with the top menu with settings and stuff being on the left and not the right? And where's the Gmail logo? ooh is that google voice calling within the gmail window i see?? 1) Drop-downs next to the signed-in user account, the report issue link (there feature is already in Gmail, but might be related to Chromium OS). 3) The corners of the "windows" are now square. 6) Phone calls in/via chat. 7) The links for Read, Unread, Starred... are now place someone where or are gone. This is not the full screenshot. Buzz is right there, below Inbox. I thought unthreaded mail was on the way. I like the evolution of the design. I do NOT like the compose button there. Also: Buzz in Google Apps! Buzz should be there below Mail or Tasks, no below Inbox, that would make more sense, as it's like a new app, no Mail-related. Links are not underlined anymore. Espero que essas mudanças ocorram em um futuro próximo, pois o hotmail está muito bom e intuitivo. Please oh please include support for searching with wildcards. Partial word matching make gmail useless to users that deal with lots of order codes or part numbers. Awesome, this constant development is what makes Google products so dynamic, in my mind. I really do hope and think that's a Google Voice phone feature . . . This guy is selling his idea to Google for 700 Million...? It only says one thing, GMail will be the one stop site for all your Google cravinga. Docs, Voice and other Google services will soon be added there. Please let me fwd all attachments of the thread to the current email I'm composing. I'll deselect what I don't want. Right now I have to download attachments and add them again. This will be very helpful when adding in a new person who needs attachments for context. Use "forward all" in the conversation you want to forward. Thanks @Alex. In my scenario there's multiple emails in the thread, each with with their own attachments. "Fwd All" would work to fwd the email of course. Right now I'd just fwd each email and its attachment or download them all, start a new email, and attach them all again--together. Seems like Google is getting itself ready to compete with FB. 2) Add ability to friend Google / Gmail users which lets you see his private information (not just the public information found on his profile page). 3) mail, contacts, tasks ... update status ... other Facebook services. 4) Let users find profiles in a new people search engine with one box in plain Google web search. 5) Still need work on a social photo application. Could Picasa be revamped and integrated? 6) Social games as a completely different site to which you can login using a Google account. Do all of this before FB goes public. Ionut can you post a link to the full screenshot? Well, I wish I could be more visible the background chosen either moving buttons on the left side and top and / or reducing and / or moving a little reading pane. Thats really great but maybe that can be. In my e-mails, I usually get 100 messages in a thread before gmail splits the thread. I really really very much like the new pattern for "select all + actions". I think that will copied from now on. I'm 100% sure, this screenshot is of the mail box of a typical Desi man! Shame you didn't blur out his name in Google Talk, it's now quite easy to get his email address. Minor features..lets c when they implement it! Feels like Gmail UI is overdue an bit of a refresh. Looking forward to it. Is Tasks is like new app or it still opening in pop-up? Are any new features added in this app?